Our existing customers benefit from huge time savings in this area. 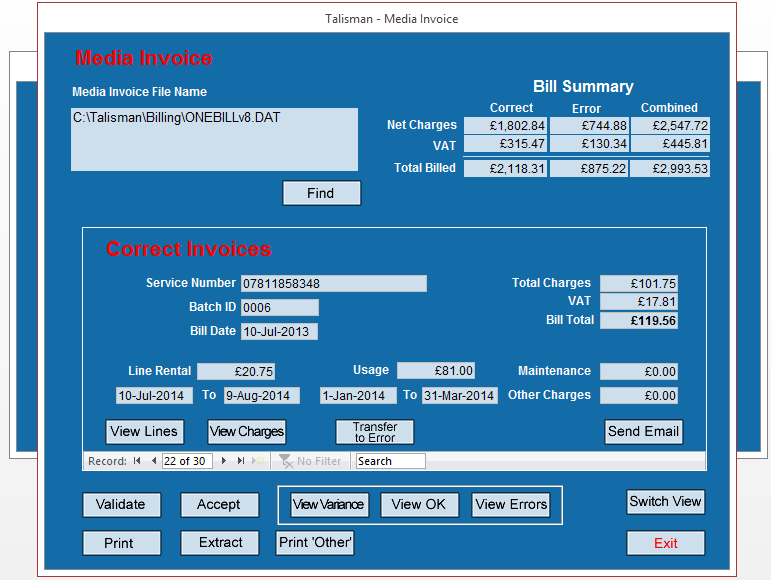 TALISMAN processes and verifies billing against historical data, allowing subsequent reporting. Clients can then approach the supplier with unresolved errors well-before payment becomes due. Cost apportionment is also a task that is typically tedious for companies. TALISMAN categorises component costs into rentals, call charges, maintenance and non‑recurrent for assignment to charge codes. Retaining attribute information such as user, location, purpose and cost-centre, rather than devolving this to the supplier is a key benefit. For example, a cellphone and its number may be re-assigned several times; this is held and updated within TALISMAN and the supplier no longer needs to be appraised. Overall, we expect TALISMAN to reduce the time expended in reporting, collating and general management of telecoms issues within the organisation by at least half. A report and file can be produced for your company's General Ledger system, identifying charge codes together with the amounts to be charged against each one.